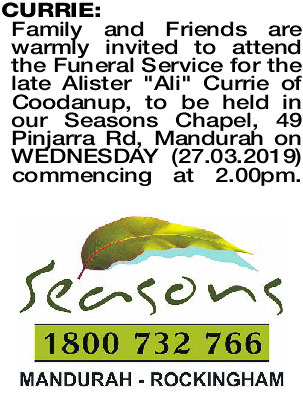 Family and Friends are warmly invited to attend the Funeral Service for the late Alister "Ali" Currie of Coodanup, to be held in our Seasons Chapel, 49 Pinjarra Rd, Mandurah on WEDNESDAY (27.03.2019) commencing at 2.00pm. 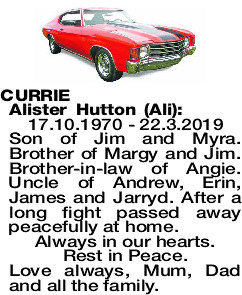 17.10.1970 - 22.3.2019 Son of Jim and Myra. Brother of Margy and Jim. Brother-in-law of Angie. 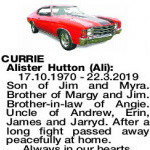 Uncle of Andrew, Erin, James and Jarryd. After a long fight passed away peacefully at home. Always in our hearts. Rest in Peace. Love always, Mum, Dad and all the family.